The San Francisco Bay Area has long been a hotbed of counterculture especially in the 1960s when shockwaves from the Summer of Love and its music acts including Jefferson Airplane, the Grateful Dead, and Big Brother and the Holding Company spread around the world. This spring, various currents of this counterculture are being brought into the mainstream with a trio of ambitious museum exhibits in the San Francisco Bay Area. 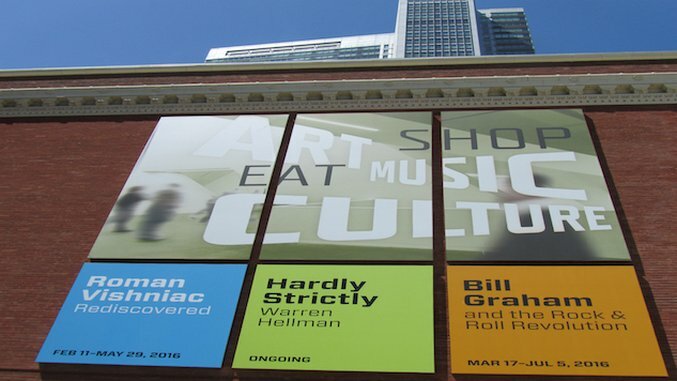 The San Francisco music scene would never have exploded in popularity without the assistance of Bill Graham, the legendary concert promoter and owner of famed venues including the Fillmore Auditorium, the Fillmore East, and the Winterland Ballroom. After escaping Nazi Germany as a child and becoming the recipient of a Purple Heart for his time serving in the U.S. Army during the Korean War, Graham, who actor Peter Coyote described as “a cross between Mother Teresa and Al Capone,” led nothing less than a fascinating life. While the focus is on Graham’s vital work in the 1960s and 1970s, the exhibit continues on like a stellar rock jam with a surprisingly vigorous coda that takes in his impressive 1980s accomplishments including the mounting of the first large scale outdoor rock concert in Russia and producing the American portion of 1985’s Live Aid before his death in 1991. The center of the exhibit is a glass case where four living and healthy cannabis plants are on display (pictured above). Some of the 10 sections are a bit hazy, like a pot-fueled evening, due to the lack of scientific evidence in some areas of research, but the information about the drug’s legal status in the state is intriguing. Even more fun are the sections devoted to pot’s influence on popular culture from an album cover of Miles Davis’ Birth of Cool to a section of pothead “Best Buds” ranging from Cheech and Chong to Broad City’s Ilana and Abbi. The new exhibit created by The Grateful Dead Archive focuses in on something very specific: photos of the band and its fans by professional and amateur photographers. Located within the University of California, Santa Cruz’s McHenry Library, the one-room exhibition features more than 200 photographs, images, and artifacts gathered from 21 photographers. Throughout “Imagining the Dead,” the exhibit touches on how the band’s growth coincided with the rise of rock photography. Some of the most interesting display cases include one with images from the band’s 1978 show in front of the Great Pyramid and Roberto Rabanne’s photos of the group recording their first album in 1967, but a display with the marionettes of Jerry Garcia, Brent Mydland, and Bill Kreutzmann (pictured above) that starred in the band’s “Touch of Grey” video steal the show like a blazing Jerry guitar solo. Stuart Thornton lives in coastal California and is the author of the Moon Coastal California Handbook, the Moon Santa Barbara & The Central Coast Handbook, Moon California Road Trip, and the recently released Moon Monterey & Carmel Handbook.